Explaining about Daizen Temple (Daizen-ji), we have to first explain about a great Buddhist priest called ‘GyokiW’. Photo from Bodhisattva Gyoki and Hozen-in. Gyoki was born in Osaka in 668 and became a monk at Asuka-deraW in Nara at the age of 15, and studied under master DoshoW as one of his first pupils. Gyoki studied YogacaraW, a core doctrine of HossoW, at Yakushi-jiW. He traveled around Japan as a preacher and helped the poor. Gyoki spread the message of Buddhism all over Japan and helped constructing temples, which were more like community centers at that time, roads, bridges and canals for townspeople. Gyoki is also recognized as the founder of mapping in Japan. According to a 14th Century TendaiW source, “the Bodhisattva Gyoki travelled Japan and determined the boundaries of the country. At that time he drew what he saw: the shape of the country as a one-pointed vajra.” The VajraW is a symbol for both the thunderbolt and the diamond. Gyoki saw, through traveling the mainland, that Japan was indeed shaped like the lighting bolt, -a symbol of the “natural force” of the land-, and at the same time, having the “irresistibility” of a diamond. Having worked in this irresistible locale his entire life, Gyoki is also often considered Japan’s first civil engineer, as he literally paved the way for infrastructure and the creation of places of worship. Thus, Gyoki-type Buddhism is fundamentally congruent to the availability and specific imagery of early Japanese maps. Since the regulations at that time strictly prohibited priests’ activities outside their temples, Gyoki and his followers were persecuted by the government, although the government forgave him later because of his popularity and administrative skills in public works. In 745, Gyoki became the first priest who was given the rank of ‘Daisojo (similar to the Archbishop in Christianity)’, and was ordered by the Emperor to be the responsible for building DaibutsuW (Big Buddha) of Nara. 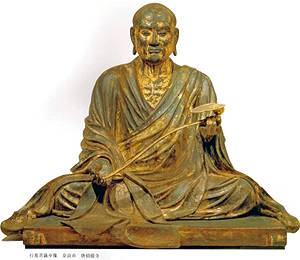 With this remarkable work, he was recognized as one of the four great monks of Todai-jiW. Now you know a bit about Gyoki…. 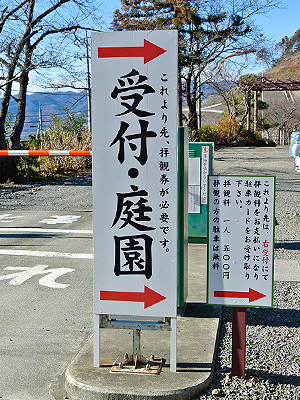 Signs by the road showing you where Daizen Temple is. While Gyoki was traveling all over Japan for preaching, he passed this area, Kai provinceW in 718. On the last day of his Buddhist training on the big rock of Hikawa Valley, ‘Yakushi-nyorai (BhaisajyaguruW)’ appeared in his dream holding a bunch of grapes. He realized that this dream was an oracle to create the holy statue of ‘Yakushi-nyorai’. 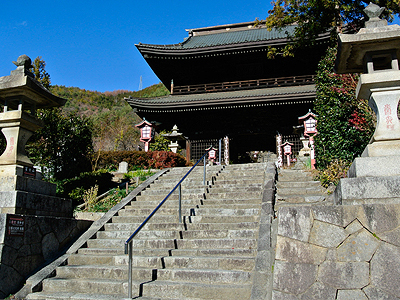 Gyoki did so and placed it in the temple, the temple now known as Daizen-temple. 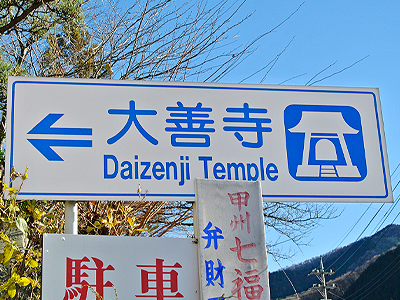 The sign showing you where ‘Daizen Temple’ is. Once you enter the gate, stop and check in at the reception counter for parking your car. While Gyoki’s stay in Kai province, he also cultivated the land for vineyards and taught the villagers how to grow grapes. The legend says that this was how the grape cultivation started in this area. Later in the history, Takeda KatsuyoriW, a son of Takeda ShingenW, was defeated against the allied forces of Oda NobunagaW and Tokugawa IeyasuW in Battle of NagashinoW, one of the famous battles in the age of Civil War in Japan. Absconding his way to Iwadono Castle, he stayed and slept at ‘Yakushi-do’, the main building of this temple, offered his prayer for the resurgence of the Takeda Family. However, half of the retainers gave up and ran away during the night while he stayed in Daizen Temple, moreover, the lord of Iwadono Castle betrayed him. Katsuyori and his retainers headed for Mt. Tenmoku though their way was blocked by the allied forces of Oda and Tokugawa. Having lost their way to survive, all the members of Takeda family and their retainers put an end by killing themselves. This was the end of Kai-Genji, a family of Kai province warlord which had an Imperial progenitor that lasted for more than 500 years. Vineyard layers seen from the second gate of the Temple. 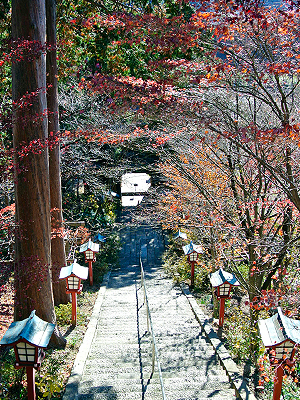 The tragedy of the Takeda family was witnessed and written by a nun, Rikei who was living in Daizen Temple at that time. 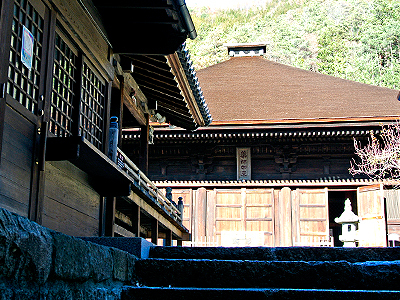 Her book ‘Rikeini-ki (A nun, Rikei’s record)’ is still stored in Daizen Temple. All the descendant of Takeda Katsuyori’s retainers were adopted and taken good care by Tokugawa Ieyasu, later in Edo period, made them castellanies, sending them to the castles all over Japan. 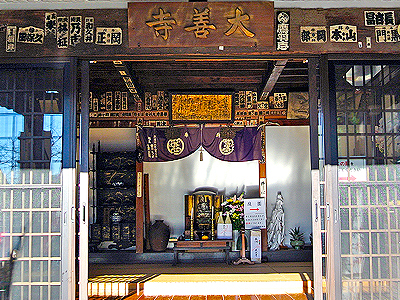 The Satues of ‘Monju-bosatsu (ManjusriW)’ and ‘Bishamonten (Vai?rava?aW)’ still remain in Daizen Temple of Yakushi-do which they have donated. 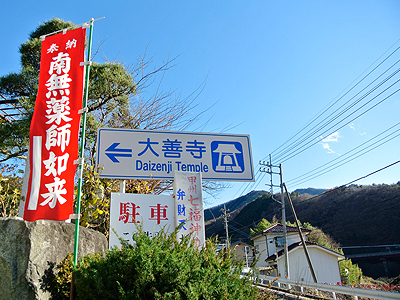 Daizen Temple is a temple of Shingon-shu Chizan-haW Buddhism. Yakushi-do was built more than 700 years ago, in 1286. It is the oldest building in Yamanashi prefecture. The GohonzonW of Daizen-temple is Yakushi-nyorai (Bhaisajyaguru) who holds a bunch of grapes in his hand is a secret Buddha, normally hidden inside the small alcove in the main building. There is a photo of this Yakushi-nyorai in front of the alcove so that you will know how it looks like even if you visit the temple when it’s not the time for kaichoW (exhibiting the Buddha to public once every some year). 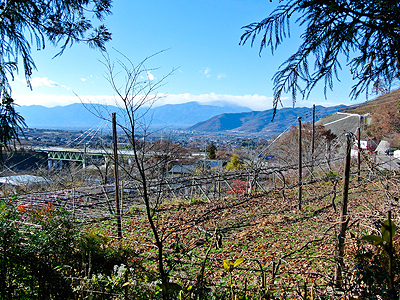 The kaicho of the grape-holding Yakushu-nyorau is once in five years, together with other temple treasures. The next kaicho will be from 1st October to 8th in 2018. Even if you come to Daizen Temple on other days like we did, it is very worth while to see ‘Nikko-Bosatsu (SuryaprabhaW)’, ‘Gakko-Bosatsu (CandraprabhaW)’ and his ‘Juni-Shinsho (Twelve Heavenly GeneralsW)’, which were made in Kamakura periodW, all standing in a line which is the highlight of this temple. It is pretty rare to see the main Buddha and other Buddhas placed in one line as they are usually placed dimensionally. What makes these Buddhas stand out is that they have been taken to maintenance in 1954 and the primary colour and patterns painted in Sengoku periodW came back under the lacquer of Edo periodW which had been a protective material of the real colour underneath. By looking at the beautiful colour still remaining on the wooden statues you could tell what Takeda family’s colour ‘Takeda red’ was like as well as amazing patterns drawn and the figure of the armours used in the ancient days. They may also remind you of Anime characters which specializes in fantasy battles if you like Anime. You can go into the space behind these great statues, where you can see many Buddhism works including ‘Rikeini-ki (A nun, Rikei’s record)’. ‘Yamabushi’ cutting the wisteria root at 6-meter high. Photo from Daizenji Offial Site. The festival is originated from a legend of a big serpent, held on 8th May every year. There was a big serpent in a small cave under a big zelcova by the mountain runoff. Every night, this big serpent went to the vineyard to feed itself with great amount of grapes. When its stomach was full it went back to its home and threw up the grapes it ate into a big hole. This folklore is one of the legends of how wine cultivation started in this land. Now on the festival day, they hang a big root of a wisteria, regarding it as the legend big serpent, cut by the YamabushiW from 6-meter high. The first person who catches the cut-off piece of the wisteria root in this festival is thought to be the ‘Luckiest man’ throughout the year. Many attend hard to get the first cut-off. The rest of the cut-offs are cut into more tiny pieces and are given out to people who attended the festival. The tiny root piece are taken home and placed on kamidanaW, which will bring a fortune and best harvest. 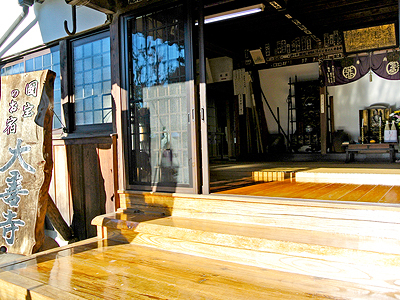 You can stay in Daizen Temple like Ryokan (Japanese inn)W if you’d like! On weekends and the day before holidays from March to November the fees will be charged additional 200 – 600 yen. ** You should take your own pajamas, towels, toothbrush… there is no complimentary goods. If you visit in more than 10 people group, Buddhist cuisine lunch is available. (You should reserve beforehand.) The lunch seeing the beautiful garden inside the temple which was created in Edo period will be splendid. There are 3 types of lunch courses, 2,100 yen, 2,625 yen, and 3,150 yen. Although you are not in a group of 10 people, if you are lucky, we mean if some other groups has made a reservation on the same day, you can eat lunch this lunch. So do not hesitate to ask for the possibility! Address : 3559 Katsunuma, Katsunuma-cho, Koshu-shi, YAMANASHI Pref.